On Friday I was diagnosed (*sort of) with Strep Throat, capitol S and capitol T. (That’s how it felt in my throat anyway.) I started antibiotics and took to the bed as the doctor ordered and as my body demanded. I am almost back to the land of the living, though I suspect it will be a while before I am back in peak form. In an effort to document just my illness, and because I never miss the chance to make a list, I thought I’d break it down by the numbers. The moral of this list is take care of yourselves folks. Get your flu shots! Sanitize your hands! Don’t drink after strangers! Do what you gotta do to stay well! *And a final number: Apparently if you test positive for strep, there is a 99% chance it is accurate. If you test negative (as I did) there is only 70% chance the test is correct and the doctor gives you the meds anyway. So that begs the question I intend to ask the next time: Why do the test? This is going to be a personal post today. For those of you who don’t know me personally, I hope you’ll bear with me this week so I can share a little bit about what’s going on in my life. There will be more writing stuff next post! To be honest, this is just too much to write on Facebook so I am using my blog to tell the story of my impending relocation. To put it out there in the (cyber) world, my husband and I are moving to Vegas! More specifically to Henderson, NV, a suburb of Vegas. But let’s be honest, it sounds so much cooler to say we’re moving to VEGAS! Amiright? It was not an easy decision to make but we are both confident that we’re following the path we are meant to follow. This journey is already requiring a lot of stepping out in Faith and that won’t change once we’re permanently out there. This is a dream job for him and he’s loving it. I am truly thankful for that. He’s sacrificed a lot for our family over the years and I am thrilled he’s found a job that he is going to enjoy. I’m still in the job market out there, but hopeful something will happen for me when I arrive and can physically get to interviews. We’re keeping our home in Arkansas. The kids will be living here, taking care of the cats and themselves! That’s the hardest part of this, but as my practical child put it, “Mom, we’re not going to live with you and Dad forever, so you may as well take advantage of a good opportunity while you have it.” Wise, that one. I am excited for this. The adventurer/writer in me is super pumped to be living “thisclose” to a thriving city plunked right in the middle of a beautiful part of nature. There is so much to see and experience in a large city (besides the whatever you do that must “stay in Vegas” things). I’m looking forward to exploring all the area has to offer. Plus, I never thought I’d live in the desert, but I’m hoping it will turn out great for my tends-to-frizz hair. Bonus: Do you know how much closer I will be to San Diego Comic Con? 1,297 miles closer. I DID THE MATH. I am sad about this. I have literally have moments of unspeakable despair when I think of who I am leaving behind. Beyond my amazing children, I have friends here who “get me” and love me anyway. It will hurt to leave them, but I am banking on technology keeping us together remotely. I am persistent so I don’t plan to give them a chance to forget about me when I’m gone. Besides, I already had loads of experience with long-distance friends. I’ll just have a few more now. In the last few weeks as I prepared to go, I have already missed a lot. I missed my daily writing and emailing my CP every day and Tweeting. I am ready to get in the same city as my husband and back to life as I know it, no matter what form it takes. I still have a couple weeks left at work and then last minute packing. (And donating a lot of clothes to Good Will.) 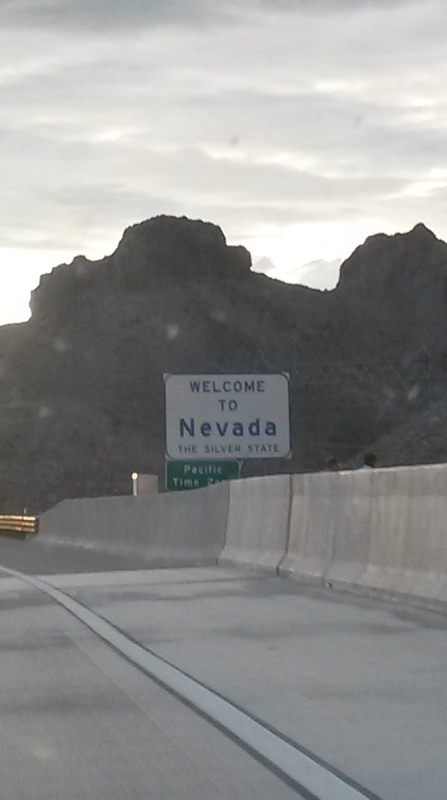 Then I’m off to Nevada. After that, I’ll be back to writing and living life and I can’t wait to see what that will look like! I vowed to get rid of the corpse as soon as I came to the first traffic stop. So I drove along my route as I normally do, singing along with Ed Sheeran (because he’s Ed Sheeran). I was right at the bridge of the song, time to really belt it out, when I approached the stop sign. I applied the brakes and something surprising happened. The force of the car slowing flipped the dead fly over. He was no longer belly-up as he had been. He was suddenly standing there on his spiky spindly fly legs. And I thought, “Hm, SCIENCE!” Then I tried to remember what type of force it was that created the phenomenon and how many legs flies have. When I passed through the intersection and was underway again, naturally, I paid attention to the road and the other drivers. But, something caught my eye. It was a tiny flicker of movement first, but it increased until I had no choice but to investigate. Imagine my surprise when I realized the fly was alive and he was staring in my direction, taunting me, daring me to swat him away. I knew at that point there were three possibilities. One, the fly had been playing opossum, or some insect version of opossum (ladybug?). Two, the virus is real and this fly is a Walker. Or three, it was stunned and had regained consciousness. I was forced to quickly discount my first two wild (but creative!) theories, so I decided my third theory was correct. This fly was a fighter and it wanted to live. So I named him Jeff Goldblum. By the time I turned onto the street by my office, I was rooting for Jeff Goldblum. I cracked my window to show him the way, like a lighthouse shining through the dawn mist guiding sailors home. He fluttered his wings, bouncing and hitting the dashboard hard, but he would not give up. I spoke to him. “You can do it, “I said. “Fly, Jeff Goldlum, fly!” I said. For a brief shining moment he took flight. He ascended into the air, hovered for what was probably a lifetime to him. (Roughly three seconds for me.) Then he plummeted downward,crashing in front of me and slowly drifting his way toward the gap in my steering wheel column. I gasped in horror. Was this the end for Jeff Goldblum? It couldn’t be. He had a life yet to live. He had places to buzz and leftover food to devour and people to annoy. I didn’t want him to be dead. I wanted him to live. So I did what any good and benevolent lifeform would do. I used a discarded menu found in the recesses of my car and I scooped Jeff Goldblum from his precarious perch and I carefully opened the car door, depositing him among the flowers in our beautifully landscaped flower bed. I don’t know what happened to Jeff Goldblum. I’d like to think he regained his full strength, flew to a nearby rosebush and met the fly of his dreams (Geena Davis, of course.) After a honeymoon in the Landfill, they’ll come back and make hundreds of little fly babies. The moral of this story. writers, is to give your characters goals and then give them a thousand different roadblocks to keep them from them. I don’t like flies, yet when I found one that faced an insurmountable odds, I rooted for him. I wanted him to succeed in getting to freedom, so much so that I helped him to do it. Sometimes it is difficult to put our characters into challenging situations, but if we do, we create characters that readers WANT to win. They journey with them, experiencing the pain, the torment, the obstacles, along with them. They have no choice but to keep reading to see them succeed, or sometimes, fail. I’m going to remember Jeff Goldblum because he was a profound, if not strange, reminder to make my characters struggle to get what they want. I want to give my readers someone and something to root for.